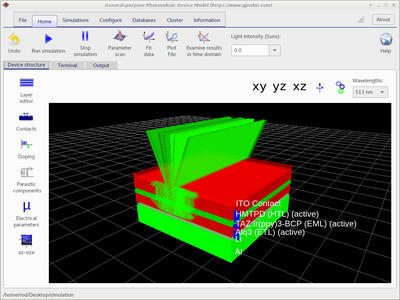 Simulate organic/Perovskite, Solar Cells, OFETs, and OLEDs!. 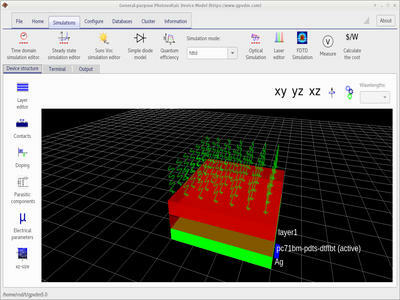 Performing optical simulations with gpvdm. Simulating CELIV transients with gpvdm. Automatic fitting to experimental data for parameter extraction. Take your research to new levels by combining experiment and simulation. Full optical model taking into account reflection at interfaces and absorption. The model makes it easy to study the influence of material parameters such as mobility, energetic disorder, doping and recombination on device performance. 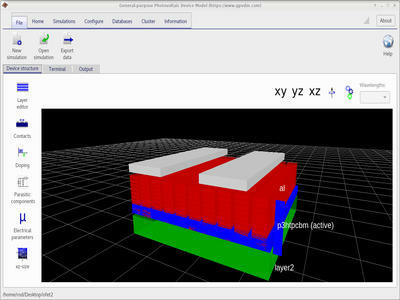 All internal device parameters are easily accessible through the graphical interface . The model solves the device equations in steady state or time domain, in 1D or in 2D. Specifically, the model solves both electron and hole drift-diffusion, and carrier continuity equations in position space to describe the movement of charge within the device. The model also solves Poisson's equation to calculate the internal electrostatic potential. Recombination and carrier trapping are described within the model using a Shockley-Read-Hall (SRH) formalism, the distribution of trap sates can be arbitrarily defined. A fuller description of the model can be found in the here, in the associated publications and in the manual. Solar cell technology will only get better if scientists and engineers understand how their devices work and how they can be improved. A good way of gaining this insight is through simulation. I have therefore publicly released gpvdm, as I would like as many people as possible across the world to have access to good solar cell modeling tools. To further this aim, I also released a version of gpvdm compiled for the Raspberry PI (a low cost $35 computer), so anyone with even the most limited resources can start simulating and understanding light harvesting devices.